It began as an occasion when fans of the Wimbledon club whose name was being taken for the evening by a Select side contesting the John Cearns Cup were lapping up memories of great nights of old; but became a meeting fans of the Kent SLYDE Kings will surely never forget themselves – courtesy of one of the most amazing performances on a Speedway track one could ever hope to see by returning skipper, Luke Bowen. There’s nothing like taking it easy after a track return having been out for nine weeks with a broken shoulder – and this was absolutely NOTHING like it! The Kent captain was truly flying, making even his famous nickname ‘Bowen 747’ seem an understatement, in what was quite simply one of the most exhilarating displays ever seen at Central Park, sending the large crowd into a state that really could only be described as rapture! It was meeting number 101 since the sport of Speedway came to Central Park Stadium and if 101 sounds rather like the starting point of a game of Darts, well Bowen quickly delivered a ‘double top’. The inspiration of having to face two of his most esteemed predecessors in the roles of Kent Kings’ skippers and number ones in his first two rides in Stevie Boxall and Ben Morley made up Bowen’s mind for him – even if he’d ever considered a gentle settling-in return (which of course being the racer he is, he never would have!) – there was to be no possibility of taking it easy with these two names to face. Heat one was a classic. 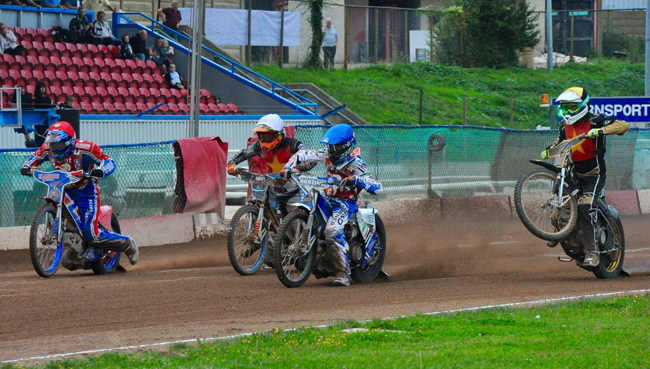 The 2013 NL Riders Champion Boxall flews from the tapes with Bowen in hot pursuit – for 15 bends Bowen tried alternatively the inside line then out wide towards the fence, trying every line and straining every sinew of his body and of the machine to get past his one-time Rye House Rockets team mate. The 16th. and final bend he went wider than before into the dirt of the outside line and stormed past Boxall pipping him on the line. The packed grandstand went absolutely crazy. It was a goosebumps moment for sure. Next race up for a now exuberant Luke was against Ben Morley - the rider he replaced as the SLYDE Kings’ number one last year and in an odd reversal has for most of the past nine weeks been the ‘Guest’ dominating in Bowen’s number one race jacket. The Kent captain’s super-fast win in heat six restored what the home fans would call the natural order. The great racing wasn’t just coming from the direction of the ‘big three’ though. 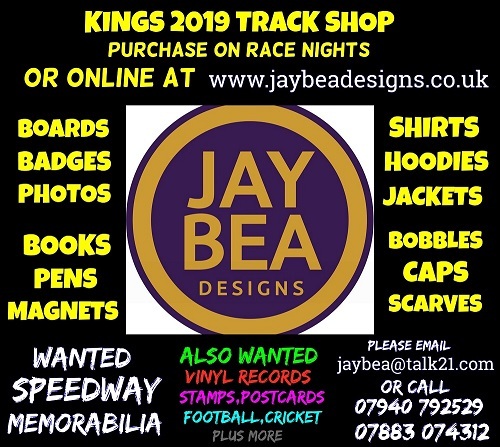 The other ‘original’ King in the Dons’ septet was Connor Coles – and fair play to the young man, his hunting down and superb pass of the Kings’ Kiwi racer Bradley Andrews in the following heat was out of the top drawer. Andrews seemed inspired by the occasion too – his grandfather Bob who was a multi-World Finalist when a Wimbledon rider back in the Londoners’’ glory days was remembered in the programme and it lifted the young New Zealander to an excellent paid double figures score. Of course, there was another rider making a comeback from a shoulder injury today as well and that was SLYDE Kings’ debutant Dan Greenwood, finding the John Cearns Cup match a great way to get back into the swing of it in new team colours and on a circuit where all are very aware that the Wolverhampton-based racer twice lowered the track record just over a year ago. A paid 11 showing including a 5-1 with racing partner Ben Hopwood over Morley was impressive stuff and bodes extremely well for the busy run-in with six Travel Plus National League [TPNL] matches to negotiate with the coveted Play Off qualification in the club’s sights. But good as heat one had been and the racing which followed was more than enough to satisfy the increasing numbers coming through the Central Park gates, they were the hors d'oeuvres for a heat 13 which no one would argue against being the best race seen here, even though there had been a full one hundred fixtures previously at the circuit. Jack Thomas departed the fray through a fall in the first staging, setting up a rerun featuring the undisputed big three. Morley flew from the traps; Boxall in second; Bowen doing everything he could to get back on terms. For four breathless laps, the three masters of Central Park fought it out. On the final home straight Bowen went for a gap that no one else would ever have even seen let alone consider the possibility of getting through it and in the literal definition of a blanket finish took second just centimetres away from victory. It was a race to make you glad to be alive to see it. Bowen’s smiling face was a picture but then again there were smiling faces all over Central Park too – smiling not least at the prospects that a fully in-form Kent SLYDE Kings’ septet look a major force for the rest of the TPNL campaign – which continues with Bank Holiday afternoon action against the side currently in second place in the table, local rivals Eastbourne. The Eagles come in to land at Central Park Stadium in a meeting on Monday (28/8) which being a Bank Holiday has a 3.00pm start time. A large crowd is assured for what is shaping up to be a thriller and is an absolute ‘must-win’ for the still undefeated at home in the TPNL Kings - gates open at 1.30pm.